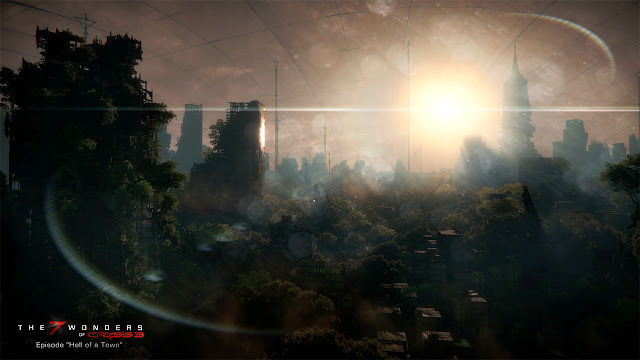 The upcoming Crysis 3 will be a graphical and technical tour de force on PCs and maybe even on consoles, of course this is something that we expect from a Crytek game. Crysis 3 producer Mike Read said that they are very interested in cloud gaming and cloud streaming technologies, singling out Sony and their Gaikai purchase, and the NVIDIA GRID platform. Crysis 2 was part of Gaikai's games catalog before the Sony acquisition, so Crysis 3 and other Crytek games might very well come to Sony's upcoming PlayStation cloud gaming service and to other cloud gaming services like OnLive. You might ask what could be wrong with the looks of the by far best looking video game on the market. Well, Crytek are certainly masters of rendering large scenes with huge detail and pushing the technology side of gaming, and coming up with technical buzzwords like PADM (pixel accurate displacement mapping) along the way. They are pushing for graphical realism with especially great results on the lighting front, rendering lush areas with dense vegetation and water. The below screenshot from Crysis 3 sums up pretty much at what Crytek is good. The lighting in Crysis 3 looks spectacular, the bendable grass and other vegetation that gets affected by wind is something that wasn't achievable on a large scale until now with Crysis 3 and ups the immersion quite a bit, and the great real-time dynamic water ripples and water volume caustics that are even reflecting on nearby surfaces simply look pretty. I wonder why Crytek doesn't do realistic hair on characters when they are able to do lush grass that is affected by wind, maybe it's coming soon. I'm a huge admirer of Crytek and their ability to push their game engines like the latest CryEngine 3 and am very curious with what they'll come up in the sure to be coming CryEngine 4, the word spectacular again comes to mind. Below is a video where Crytek senior field applications engineer Sean Tracy demonstrates the many technical bells and whistles of the latest version of CryEngine 3 that is powering Crysis 3. But, until Crytek will be really able to render photorealistic graphics, art direction is important. Many people say that Crytek's art direction is generic, that's something that could be argued about as it's subjective. The problem is perhaps that people are so used to the art direction of Hollywood sci-fi blockbusters and the art direction in Crysis games resembles that art direction, but in a how should I put it, hm... uncool way. As I remember Crytek's games the scene from the beginning of their very first game and breakout hit Far Cry comes to mind. As I as Jack Carver stepped out of the dark and confined shelter in the side of a mountain into the gleaming sun that illuminated a marvelous lush expansive tropical bay I fell in love with Crytek's games. It was as like Crytek liberated gaming from the dark brown corridors of Doom and elevated it to paradise. Then came Crysis and it was a technical marvel that pushed graphical realism and brought with it the meme 'Can it run Crysis?' I loved it, though it certainly had its flaws. When I first saw the water in Crysis I was in awe, then came the jungles and the huge environments with the Onslaught map with that large tank battle in the huge valley especially memorable. I wasn't amused when Crytek changed the lush tropical islands with the confined claustrophobia inducing streets of New York in Crysis 2, damn you consoles. I hate bankers and don't want to play a video game depicting their mecca. It was like the Crysis series was doomed like the economy. Crysis 3 is returning to New York, though I do like the fact that nature has claimed back its reign from the symbols of capitalism. Both Crysis successors have certainly upped the graphical ante, though they are a little more confined regardless of verticality. But with the next generation of consoles at the doorstep I certainly hope that Crytek will return to the lush expansive environments in the next Crysis game, whether it will be called Crysis 4 or more likely Crysis: Something. With every game that Crytek makes they step closer to photorealism in graphics and animation. But with every successive Crysis game something feels off, though you can't exactly point with a finger to what this thing or things that are off really are. Right away the term uncanny valley comes to my mind. The term describes the unconscious feeling of revulsion that people feel when they see a computer generated human character that is rendered and acts almost realistic, but slightly off what is expected of real humans. People unconsciously feel as though these almost realistic human characters are sick, either mentally and/or physically. Like when they see the expression on faces of people that have Asperger's syndrome or Autism, Adam Lanza anyone. Or when they see people that have some chronic illness and express their miserable condition with lethargic facial expressions. A great example of the uncanny valley is the computer generated movie Final Fantasy: The Spirits Within based on the Final Fantasy video game series. And back we are at the art direction, the enemy of the uncanny valley. We often quite like stylized computer generated human characters that are animated with exaggerated emotions as our brain tells us these aren't real and we should have fun enjoying their antics. Not so with near realistic characters as our brain thinks that there has to be something wrong with that character though it can't point out exactly what. But I think it's not only that way with computer generated characters, but also with computer generated environments and other details of computer generated worlds. As long as the virtual worlds have stylized dream like environments and are populated by stylized trees and plants that sway in a stylized way it is very pleasing for people as they feel like they are gaming in some dreamscape of theirs. I think as soon as the environments, the trees and the plants approach near realism, they induce the same feeling in people that there must be something wrong with the scene. They feel that the art direction is bland and generic. Noticed the word art direction? Something that feels realistic shouldn't be connected with the word art direction, but because the graphics, animation, lighting, shadows and colors are slightly off from reality it simply feels weird with bland colors and stale environments. A good example are the Halo games and especially Halo 4. Many people think that Halo 4 looks better on the Xbox 360 than the Crysis games running with all settings turned up all the way on a high-end PC. How can that be when Crysis trumps Halo 4 on virtually all technical fronts? Art and style. Halo 4 also has seemingly expansive environments, though they come not even near when it comes to dense vegetation. As soon as someone who knows the Halo games sees an environment from Halo 4 they know that it must be from Halo. It's the same with the characters and spaceships. Isn't it funny that the aliens from Halo look and behave very funny, colorful and cartoonish for a game that takes itself so seriously a lot of the time, and the fans of the game are willing to defend it fiercely against individuals that make fun of it. Of course this has a lot to do with Microsofts deep-pocketed hype machinery, but yeah, it's the iconic style and art direction of Halo that gets gamers excited. I think that with every Crysis game that developer Crytek crafts with German precision and discipline, striving for graphical realism, they step deeper and deeper into the uncanny valley. It could be argued that Crytek achieved photorealism with the CryEngine 3 in some aspects like water, some plant life, lighting, shadows and particles. But the whole package makes the deal. Aliens - The criticism that Crysis' aliens are boring and uncool comes up a lot and I share that sentiment. In Crysis Crytek started with the squid like alien designs that resembled the machines from The Matrix. They were boring and uncool, except the giant multipede robot and the final boss was passable. To put it mildly, in Crysis 2 and 3 it seems like Crytek is more and more migrating to the Halo like colorful and cartoony look for the aliens, but with a realistic twist. I think they look like gay aliens that would rather dance to some Y.M.C.A. tunes than fight some brute with a superpowered suit fetish trying to violate them. Not fun, not cool. And why do the aliens move so weirdly? Is it because unlike humans they weren't made for walking? Would Crytek go to such great lengths for realism? Human Characters - People think that Crysis' human characters are boring and they can't emotionally attach to them. The uncanny valley rearing its ugly head or rather Crytek going to far with realistic heads and faces without the corresponding realistic animation. Just look at Psycho who will make his reappearence in Crysis 3. Does the guy shave with an electric shaver all over his head every day, there are so many pits, nooks and crannies in that face that it looks like some cratered lunar landscape. Perhaps an 8K screen would do Psycho's face justice, with a 1080p screen it looks just like someone processed his skin with sandpaper... maybe a widespread prank under military buddies. And there is something off with the skin color of their faces, regardless of the use of subsurface scattering. The facial skin of other characters doesnt't look much different, except the chicks fare a little better but have their own problems by having a facial expression colder than a blonde long-legged Russian mannequin during the Siberian winter... who misses Alyx from Half-Life 2 now? Crytek said that they are this time working on performance capture of facial animation. If it works as good as the animations in L.A. Noire this could be a step beyond the uncanny valley. When they also manage to capture the movement of the bodies in tandem with the face this could look quite good, in L.A. Noire it looked weird when you saw characters' expressive faces combined with their stiff body movements. Storytelling - Of course the boring storytelling is directly connected to the uncanny human characters and the bland aliens. But the story in Crysis 2 wasn't even that bad, it was simply hard to follow for some people, maybe some joke about dumb console gamers would be appropriate now. Crytek are not exactly masters in making cutscenes which move the story forward, as opposed to some action cutscenes which look earth-shattering, so there is much room for improvement there. Crysis 3 producer Mike Read described the game with one word as 'human', meaning the human side of the characters being the focus in the game. Perhaps this time Crytek will really tell the story with better cutscenes and expressive human characters, making them meaningful, so that gamers can emotionally attach to the characters and their story. Trees and plants - Especially the trees with larger leafs that are home in the mild temperate regions like Central Europe look bland and behave somewhat off. We are used to realistic trees with leafs, the greenish dreamlike sheen from the sun and their soothing sway in the wind. The more realistic Crytek makes the trees, the more it looks off. I guess we'll have to wait for realistic trees from Crytek until they'll look good again. The new grass in Crysis 3 looks really good, especially when it sways in the wind and bends around characters. But when you look at the individual blades there's something wrong, like they are made of cardboard that was painted green. Palms and tropical plants do look good, a strongpoint of Crytek since the Far Cry days. Though many tropical plants have large leafs that are easier to render. But all plant life shares one big problem, aliasing which comes into play the more complicated the plant life gets, so more realism, more aliasing. Anti-aliasing can help, but comes with blurriness and performance issues. This is again something that a screen with a huge resolution could solve. Environments - Like Halo 4, Crysis 3 and its predecessors are capable of some beautiful vistas of natural landscapes. The dilapidated buildings of New York overgrown with plant life and the beautiful mountain ranges of the island in the first Crysis are a sight to behold. The mountains and the topography of the environments look gorgeous, something that one can achieve with dedicated terrain generation programs. But where Halo goes with style and simplicity, Crysis strives for realism. To achieve complicated landscapes with features like overhangs they use a lot of prefabs that get stacked together, scaled and rotated. This look of complicated stony landscapes approaches realism but doesn't quite get to it which again looks boring for gamers. A large part in that also play the textures which cover the surfaces of Crysis. Either they look flat and cover complicated geometry, or they use displacement mapping to cover more flat surfaces. Both techniques make the surfaces more realistic, but again not realistic enough which induces a feeling that something is off with the environment. That brings me to tessellation, a technique that works great for some things like Crytek's top secret tessellated toad tech, bricks and waves, but not so much for some other things. The surfaces do look more natural and bumpy which increases realism, but that bumpiness is again not quite there with photorealism and in many cases looks weird. I should also mention the buildings. The virtual skyscrapers of Crysis' New York do look great, either intact or dilapidated, with the geometry of them not being a problem for Crytek because walls of buildings have to look flat. I think where Crytek fall flat with buildings is when they try to make the textures to realistic. This isn't even a problem on skyscrapers because you often see them from farther away, there is intense lighting and the detailed textures mostly look good on large buildings. But the interiors are the problem. The textures simply look to detailed and realistic up close with realism again working against Crytek because it's close but still not looking real. Combined with the lighting the interior scenes give the depressing impression of sterility with flat colors even if such an impression isn't intended. Vehicles - The art direction for the vehicles in the first Crysis was sharp, and looked great and cool based on modern US and North Korean war machinery. I don't know how Crytek went from great and cool in the first Crysis to the boring and uncool designs of the armored vehicles in Crysis 2, but they managed it. The armored vehicles in Crysis 2 scream I'm from the UN, bring peace and have round edges so I'm no threat to you. And what they have done with the choppers, from modern sleek military designs in the first Crysis to a bulky chopper in Crysis 2 where you wonder how this thing can even fly. And from the promo videos it looks like the chopper is making a reappearance in Crysis 3. I involuntarily ask myself did Crytek's concept artists and modelers get lazy to bring out such a rough slab of a generic and drab chopper, though I know that it most likely isn't that way. Crytek has licensed the CryEngine 3 to games like Star Citizen and Sniper: Ghost Warrior 2. I'm very curious what Cloud Imperium Games with a dream team of former Origin game developers under the lead of the returning game designer legend Chris Roberts will be able to achieve with the CryEngine 3 on Star Citizen. People like Hollywood sci-fi star concept artist Ryan Church are working on spaceship designs and environments, already with great results to show. Many people say that the Crysis games are nothing more than glorified tech demos for the CryEngine to get more licensing partners. One could argue one or the other way. I think that Crytek certainly knows hot to do a great action game. But it's all the better when more games like Star Citizen use the CryEngine and create games that we can't even imagine now as they are still only dreams in the minds of great game designers and artists. I think Crytek made a great move by buying the Homefront IP and developing Homefront 2. Fighting the North Koreans in Crysis was the most fun in the whole Crysis series. Fighting North Koreans on US soil, this will be awesome times 2, if not more. But please not New York again. How about Las Vegas and surroundings, Miami with the everglades where you can fight some gators in the bayou, Seattle and the surrounding mist covered mountains with maybe bigfoot and Rambo making some appearances, San Francisco with the Golden Gate bridge making a reappearance from the first Homefront hopefully without gay aliens, or some guerilla warfare in the Rockies, Yellowstone and the Grand Canyon would also be gorgeous. I also think the time is ripe for Crytek to make a pitch to SEGA for making a Predator game, or even an Aliens vs. Predator game. The art style is already predefined and Crytek can simply shoot for realism with it. They have the whole I'm a badass with a superpowered exoskeleton that can get invisible thing already down, and Crytek doing a Predator game with some Marines and Aliens to mutilate would be... badass. Metaboli, European distributor of video games for download, has entered into a strategic partnership with cloud gaming technology provider CiiNOW to enable instantaneous streaming of premier game content to Metaboli's members. By leveraging CiiNOW's proprietary Cumulus video game streaming technology, Metaboli can now offer its customers instant gaming access to a library of console-class titles beyond the PC to include Macs, Smart TVs, set-top boxes, tablets and smartphones. The games will be delivered to virtually any device with a screen and powered by CiiNOW’s cloud-based technology, enabling game enthusiasts to enjoy games instantly, without waiting for downloads or software installations. The joint service will launch with select games and under Metaboli's GameTap Club brand in France in Q1 2013 before expanding into other countries later in the year. A beta test of the cloud gaming offering is already underway. Leveraging CiiNOW’s streaming technology, Metaboli’s GameTap Club will be offered as a member subscription service featuring a variety of content and specialty services including unlimited access to a catalogue of games to download or immediately launch, significant permanent discounts on all new releases, as well as a cash back program for members who want to buy computers, tablets, consoles, or accessories. CiiNOW leverages cloud technology and innovation to deliver an instant, high quality gaming experience across all screened devices. The company’s patent-pending hardware and server management technology are architected to maximize virtualized data center environments to deliver games through PC's, Macs, Smart TVs, set-top boxes, tablets and smartphones. The CiiNOW platform, named Cumulus, moves beyond the world of software upgrades and hardware constraints, and enables service providers and game developers to capitalize on the lucrative gaming market as it transitions from physical media to pure digital distribution. CiiNOW is funded by Alcatel-Lucent Ventures, Foundation Capital, and AMD Ventures, and is headquartered in Mountain View, California. With the AMD investment, it looks like CiiNOW is quite cozy with AMD and their hardware. They have already started a cloud gaming benchmark war with NVIDIA.